Enchey in Gangtok is 200 year old Buddhist monastery and an important seat of the Nyingma order famous for Chaam or religious masked dance. The ancient gompa of Pemayangtse is one of the oldest monasteries of Sikkim devoted to Nyingma Buddhism. Located near Pelling, the monastery hosts a collection of ancient Buddhist antique idols, scriptures, sculptures of Rinpoches and decorated paintings in various floors. Built under the legacy of Nyingma order of Tibetan Buddhism, Do Drul Chorten or Stupa is one of the most important and biggest stupas in Sikkim. Encircled by Chorten Lhakhang and Guru Lhakhang, the stupa boasts of the colossal statues of Guru Rinpoche (Guru Padamsambhava) and 108 prayer wheels. The seat of Kagyu order, Rumtek Dharma Chakra Center features the largest monastery in Sikkim serving as home to Tibetan monks. Modeled on the original Kagyu headquarters in Tibet, this sacred center is a prominent home to some of the worlds most unique religious scriptures and rare objects. Located in East Sikkim, Lingdum Monastery is a dream destination for pilgrims and fine art lovers alike. Set amid serene forested hills in east Sikkim, this Buddhist center is a famous specimen of sacred architecture featuring exquisite murals, statues and adornments. Sangachoeling Monastery, the sacred place of secret spells spellbinds a pilgrim with its beautiful murals set in a magnificent backdrop. 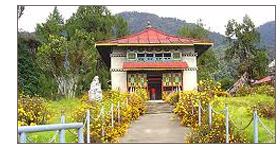 Tashiding in western Sikkim is the most sacred and holiest Buddhist monastery in the state. Dedicated to Nyingma sect of Tibetan Buddhism, the site is believed the place where Guru Padmasambhava (Guru Rimpoche) blessed sacred Sikkim in 8th century. Established during the time of Jigme Pawo, Phensang Monastery serves as a residence of approximately three hundred monks belonging to Nyingmapa order.